THIS OFFER IS ONLY AVAILABLE FOR VO2GOGO PROS. Get listed with the top talent in the VO2GoGo Pro family in a compact, easy to browse one-page listing on the VO2GoGo website, with a one-time set-up charge, a low monthly fee, and all future updates for free. See complete description below. Get listed with the top talent in the VO2GoGo Pro family in a compact, easy to browse one-page listing on the VO2GoGo website. Price includes a one-time listing setup fee of $999. Your setup fee also covers your first 90 days of listing, then your subscription fee will be $9 per month. All future updates to your listing are included in your subscription. Take advantage of the specialized, focused traffic headed every minute to VO2GoGo.com – nothing but participants in the voice over industry. Your listing will be accessible via a very simple VO2GoGo URL, and will also be listed along with all other Featured Talent on the VO2GoGo Talent page. 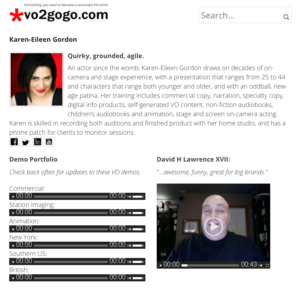 And the Featured Talent link is on the menu of every page on the VO2GoGo site. You get unlimited updates, too. 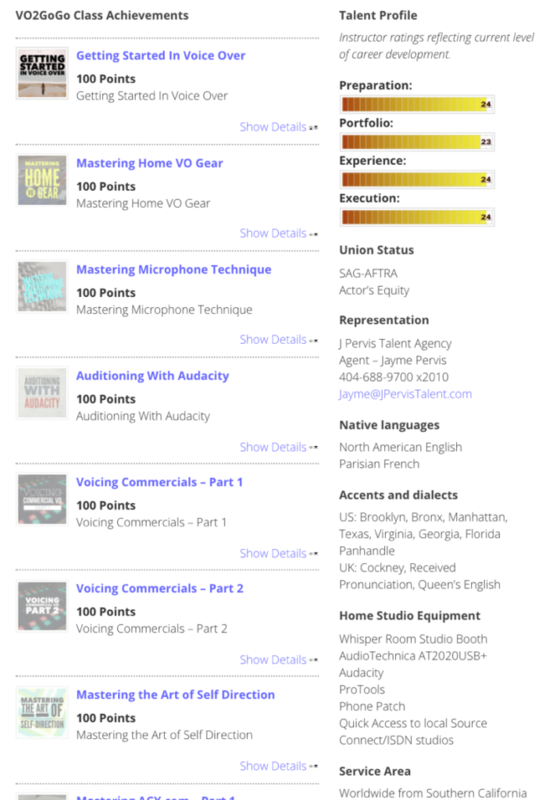 As your career progresses, your VO2GoGo Featured Talent listing will progress right along with you. As you change your experience and tools, those can be changed whenever you want. New demo? Added immediately. New class you’ve taken, or new profile on a new site? Added immediately. Just get in touch. And we remind you monthly to update your listing. And as new items are added to everyone’s profile, your profile is updated automatically.